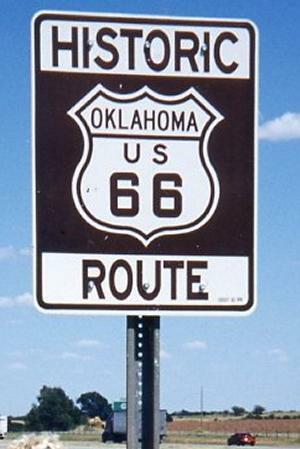 Route 66 – Mother of American Roads.
" ...and they come into 66 from the tributary side roads, from the wagon tracks and the rutted country roads, 66 is the mother road, the road of flight." Why is this road so important ? Whatever the reason, the Mother Road is an experience, a feeling, a perception, a taste of sight and sound, and a mystery that can only be resolved by driving the Route. The “super-highway,” as it was thought of in 1926, represented unprecedented freedom to travel across the American West. Route 66 is a famous American highway that once stretched from Chicago in the east to Los Angeles in the west. It has had many names in the past and is most often called the Main Street of America or Mother Road. 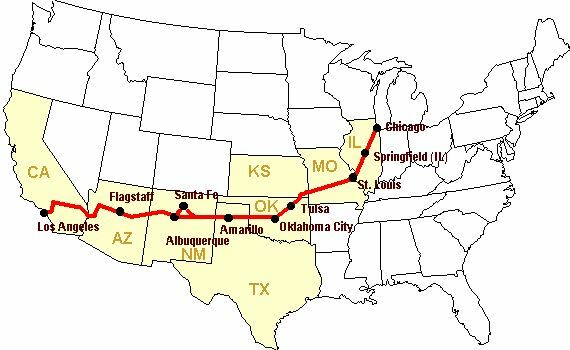 Route 66 originally ran through 8 states and covered almost 4,000 kilometers. The idea of creating an east to west highway came up in the 1920s. A plan was drawn up to connect a series of state roads to one big national highway. When World War II broke out, Route 66 proved to be invaluable in transporting troops, equipment and products across the vast West to California where the government established multiple industries and armed force bases. When the war was finally over in 1945, the Mother Road served to transport thousands of troops home.Perhaps more than any other American highway, Route 66 symbolized the new optimism that pervaded the nation’s post-war economic recovery. For thousands of returning servicemen and their families, Route 66 was more than just a highway. "It became," according to one admirer, "an icon of free-spirited independence linking the United States across the Rocky Mountain divide to the Pacific Ocean." Almost immediately, the tourist industry began to grow, giving rise to countless tourist courts, motels, service stations, garages and diners. However, the excessive truck travel during World War II and the ever expanding automobile industry had left the Highway in appalling conditions, with narrow pavements and poor road conditions. In the mid 1950s public lobby was demanding a federal sponsorship for a system of divided highways and in 1956, the Federal Aid Highway Act was passed for a national interstate highway program. With the passing of the Interstate Highway Act, Route 66 would soon be doomed. Doomed or not, by the 1960s, many points of interest were familiar landmarks to a new generation of travellers and the television series, “Route 66” was aired “driving” the Mother Road into homes all over America. Though the series created great interest in the American public, it was to be short-lived, as by 1970, nearly all segments of original Route 66 were bypassed by a modern four-lane highways. By 1984, all of the poorly maintained vestiges of Route 66 had been completely succumbed when the final section of the original road was bypassed by Interstate 40 at Williams, Arizona. As Route 66 was decommissioned, its signs were removed and the Mother Road was almost lost. Even to this day, the Mother Road appears on very few current maps. Most states have installed Historic Route 66 along portions of the road, but, unfortunately, they rarely give exit directions where the road so very often veers off from the interstate highways.Obviously, the route today is not what it was in the past. The sights and sounds of the Mother Road change daily with emergence of new businesses and development along the old highway. You will want to take a lot of pictures, because what is there today might be very well gone tomorrow. However, much is preserved and the Route 66 Historical Associations and private groups have done much to preserve these vintage treasures. As you travel along, you will often see a sign or marquee of the vintage road in front of a new video store. Route 66 has had its fixed position in American culture. It played a major part in John Steinbeck’s novel “The Grapes of Wrath”. In the 1940s Nat King Cole recorded a song about America’s prime highway which became a major hit and has been sung by many bands later on. Today groups have been formed to bring Route 66 back to life again. In the past ten years the government in Washington has provided millions of dollars to revive America’s mother of roads. Travelling the road, you will experience everything from the frustration of finding the route in a metro city to being pleasantly surprised by the next small town that you venture into. The landscape quickly changes from the hustle and bustle of the cities, to quiet meandering roads, to tall grass prairies, where you feel as if you might be the only person left on earth. While it’s a good idea to plan your trip, because the road can be confusing, the whole idea is to experience the Mother Road. My advice is to get a couple of Route 66 books and some good maps before you begin your adventure. Here and there, some places will give you a road sign when the road veers off the interstate, but mostly not. Even with some good maps, you will, no doubt take a wrong turn here and there. Take the Business Loops off the interstates when possible because they will often lead you to great photo opportunities and scenes of the past.